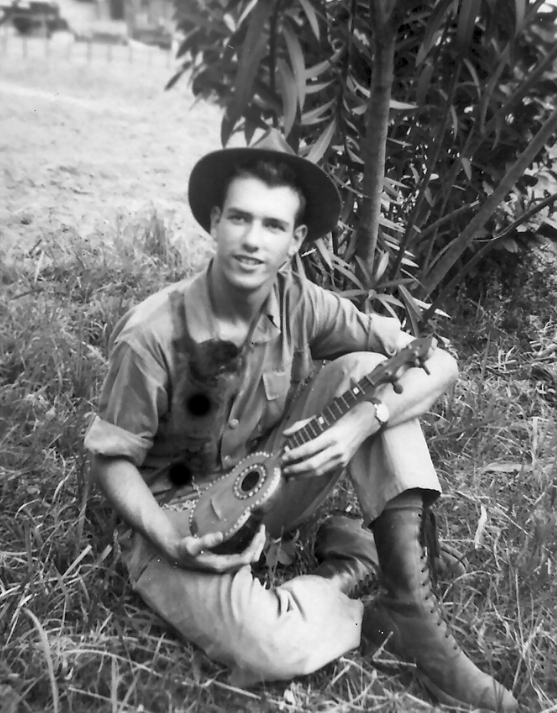 Grandfather says he was a soldier once, in the Army during Korean War times. Grandfather had developed a lot of stamina on his high school track team and, independent cuss that he was (and is), he stood during basic training forced march rest periods. Eventually cadre got annoyed and ordered him to sit down. Grandfather remembers thinking: I won, you (expletive deleted). But, he was ordered to the front of the column to carry the guide-on, when the graduating class marched before the Commanding Officer’s reviewing stand. After secondary training as a topographic surveyor, he served on the island of Mindanao in the Philippine Islands. 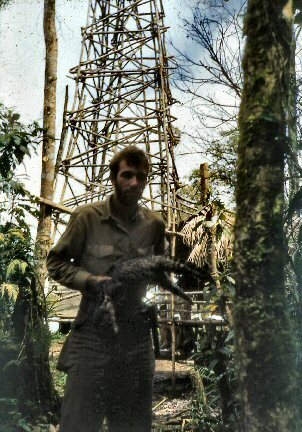 Grandfather with a civet that had been eating the survey party’s chickens. The instrument tower is in the background. Grandfather was detailed on this mountain, waiting for semi-permanent fog to clear from a line of sight to a target on another mountain twenty miles away. He was there for five months, before the magic moment arrived. The civet was taken at midnight with the sidearm on his belt, a .22 rimfire Colt match target pistol, sent to him from the states by Grandmother-to-be. But, when Grandfather was on survey party traverses through overgrown terrain, the monkey rode on Grandfather’s shoulder. He sensed anything that needed attention — for example, snakes. Mindanao enjoys the residency of all three species of Cobra.